If you are familiar with Adobe Camera Raw, or Lightroom version 3, you need to take a look at Capture One Pro 6. I got turned on to Capture One Pro when I was looking for someone to ensure perfect focus on some of my more critical work. I was doing some work that was very exacting using image stacking with either Helicon Focus or the image stacking capability of Photoshop. Reshooting precise work when a set of images must be shot with exact focus bracketing can be a real pain. Some would ask, why not just go to f/22 and hope for the best. Well, anyone who has done macro work will tell you as you stop down too much you lose detail as you leave the camera's sweet spot. In addition you will see every speck of dust in the lens. If you have ever worked in a dusty or even worse and environment with powdered metal there is no getting that dust out. I looked at getting a Marshall Monitor for its peaking filter to ensure perfect focus. The while looking around the net I saw Joey L's site and his videos turned me on to Capture One Pro. If you don't know who Joey L is, he is the talented up and coming photographer who shot the still pictures for the Twilight movie. He now uses Capture One Pro with his Phase One camera. As I always do when I look at gear and software I looked for how I might use it. Well I found its "killer app." Focus Mask. This feature, as shown in the above photo from one of the Capture One Pro videos, highlights exactly what is in focus. It was the perfect solution for what I needed. It didn't stop there though. There was much much more to Capture One Pro. Since I cannot do Capture One Pro 6 justice by showing you screen shots or verbiage, I will link you to their site and point you to the videos to watch to quickly show you the power and versatility that this program has. Don't miss reading the notes at the top of the page on the Noise Reduction advice. Go to Capture & Import and look at Capture Pilot. It is a brand new iPhone/iPad app for viewing your images while you shoot. What a great tool for an Art Director on a shoot! Having tried it, I can say that is very fast and it has finally given me a reason to get an iPad. After that, if you have time and want to see more, look at the rest of the videos on the second site. If you have not seen enough to wow you from that quick run through then I would have to say that you are either difficult to impress or you are already a user of Capture One Pro 6! I hope that this has been helpful. I tried to steer you to exactly what I felt most impressed me when I looked Capture One Pro. Why waste your time when someone can steer you to what you want without all of the searching. Some might say "well I don't use a medium format camera." Well neither do I. Capture One Pro is made by a company who produces medium format cameras, but it works very well with DSLRs. I use Capture One Prothe with my D3 and D700 with great success. My guess is that Capture One found that either the current tools did not have the feature set or were not exacting enough for their medium format clients so they came up with their own software tool. I for one am glad that they did. Side note: I have used Lightroom for my tethered shooting and post processing, but when I am not tethered I prefer to import with Photo Mechanic to add metadata/captions and do my sorting since it is the fastest application I have found for this. (This is what many of the sports shooters and others on tight deadlines that I talked to use religiously.) I then post process in Adobe Camera Raw through Bridge. (I am not a big fan of the way Lightroom uses their catalogs to hold all setting changes to RAW files. I had a bad experience with Lightroom 2 and I had to redo all of the metadata and editing of my files from Istanbul and Afghanistan.) I then use Imageprint to print my photos on an Epson 3880. I have found that all of this color calibration obsession to be a nightmare. With the great printer profiles from Colorbyte I was able to save myself a lot of wasted time going through calibration for each type of paper, etc. It is impossible for me to get anything even close to the accuracy of the profiles from Colorbyte. Imageprint is well worth the money for me. I'll have to describe it and show my samples from the Epson drivers, other RIP application profiles and the profiles from Colorbyte at a later date. In addition, I also like that there is no need to import my photos into a catalog as I do with Lightroom. Capture one merely makes its own directory inside of the directory that contains my photos to store its information on those photos. This is great for working with others and for my own backups. I am not a big fan of importing into a special catalog. (On one job I had to wait over and hour to import all of the photos into a Lightroom catalog for editing.) What I end up with with either tethered capture or just opening up my files in capture one are NEF and JPG and a Capture One directory in my image directory. My changes to images in Capture One need to be processed and output as a TIFF, DNG, or JPG so that the changes are visible in Bridge and Adobe Camera Raw. That is fine with me, since this is the same as with every other program as well. My next thing to check is to see whether Capture One passes Crop and Keystone changes on to the next file when I am capturing a sequence. I cannot do this with Lightroom tethered shooting, so my work around was to auto apply all adjustments as I shot and apply crops and keystone correction to all files (copied from the first file) at the end. To have crop and keystone applied to each consecutive file as I shoot would save me the heartache of having to explain to the art director or anyone else what the final crop and keystoning would look like. Right now in Lightroom I have to periodically copy the settings for crop and keystoning over to the lastest file as a check for myself and to show an observer what the final file will look like. With Capture One's new Capture Pilot iPad/iPhone app it would be great to have the final image pop up on the screen with all edits to include crop and keystoning for observers holding iPads to see. I got the chance to test two things on a recent shoot. First, the cropping and keystoning. Second, using Capture Pilot in a direct link between the Mac and the iPhone using the Hot Folder option in Capture One. Second, I tested using Nikon Camera Control Pro 2.7 and Capture One Pro 6 using the Hot Folder function as well as utilizing my iPhone and Capture Pilot without a router. I was able to shoot files with Nikon Capture on Live View, or Capture One normally, and see my files immediately on my iPhone. It worked great. If you get any hang-ups, just restart the Capture Pilot application and be patient. All of these links takes so time and patience the first time. New Capture One Pro 6.1 fixes the shifting problem that was experienced when using cropping and keystoning together. I just got the chance to try it. Much better! I will have to check out what else they fixed. I have been using Capture One Pro 7 for about a month now. It works great with the Nikon D4. I have used it tethered by USB, Ethernet, and Wifi, with no dropouts. The only time that I had to reconnect was when I shut the D4 off. The D4 takes a while for the network to start up and link back up when powered on. Check out the amazing highlight recovery in Capture One Pro 7 here. I have to test that out of some of my photos. I will have to see if I get anything close to that good of a result. I will write a new piece once I get the chance to test it. I am also looking forward to trying out the catalog features. The catalog in Capture One Pro 7 (with thumbnails) can be stored on your laptop with all of the files stored on external drive(s). In this way I can organize my files in the catalog on my laptop using only the thumbnails stored in the catalog file, without being connected to any external storage drive(s). I have used the catalogs in Lightroom in the past, but the catalogs became prohibitively large and unusable because they contained the actual photo files. It looks like Phase One has come up with a good way to handle this. Check out the videos by searching Capture One Pro 7 on YouTube. Tried importing one drive into a catalog - leaving the files where they were and not loading the actual files into the catalog. It got through 13000 files before I stopped it and the catalog was 20GB. By my calculation that would make 2TB of pics makes a 200GB Catalog. Not too bad for adjustable files. It would be nice if the catalog was smaller, but with full size editable thumbnails (I guess you really can't call them thumbnails...), that is to be expected. 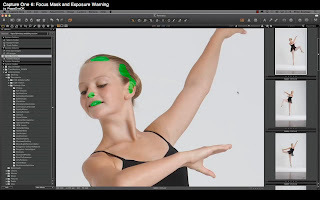 A lot of Cap One's functionality is very appealing, but it is horribly let down by the quality of its demosaicing algorithm, which is fully three or four years behind the curve of what Lightroom 3 is capable of. Deeply disappointing - and I've been a Cap One user since v.3. I have not really delved into any of the programs with a microscope that carefully. While I agree that image quality is of the utmost importance, for me sharp focus and the correct depth of field are what I worry about when I am shooting tethered. I can always do the editing in Adobe Camera Raw in post, but I can't fix the focus later. I am very glad that you brought this to my attention and hopefully someone who is looking to use Capture One will now be aware of this shortcoming after they read this and can find a way to compensate for it. Hopefully the folks at Phase One will take a look at the demosaicing algorithm and improve it in the next release. It is using older programs, but it will give readers and idea of what you are referring to. Since programs tend improve over the years the comparison on the site may be a bit dated. Thanks Keith I really appreciate your comment. I found another good article which provides additional comparison. Again, keep in mind that there have been improvements to these programs since this article was written. Adobe Camera Raw and Lightroom have had significant improvements in sharpening and noise reduction since the article was written. I disagree with Keith regarding C1-6's demosaicising algorithms. On the Phase One forum, he has raised concerns regarding certain artifacts that show up at >100% enlargement when heavy NR is applied. For most photographic purposes, this is completely irrelevant, even if true. Image rendering by Capture One is vastly superior to ACR, IMO, and it must have something to do with how it demosaicises. Set to default Lightrooms demosaicing algorithms are 'slightly' superior to Phase One AFAIK in several respects. Sharpening in Phase One still uses prehistoric USM sharpening, Lightroom V3 uses state of the art (on the fly) controllable edge sharpening, in luminosity mode, with the option of basic deconvolution sharpening - turning up the detail amount. Capture One was superior in the days of ACR V1 (ugly RGB artefacts created in those days in the shadows!) but Adobe have caught up and in critical areas such as demosaicing, sharpening and noise reduction matched or surpassed Phase One by a smidgen. These gains may be irrelevant for some people. I have used both programmes for many years, professionally, and respect both companies products, each has its strengths and weaknesses.